Credit: X-ray: NASA/CXC/Rutgers/J.Warren et al. ; Optical: NASA/STScI/U. Ill/Y.Chu; Radio: ATCA/U. Ill/J.Dickel et al. 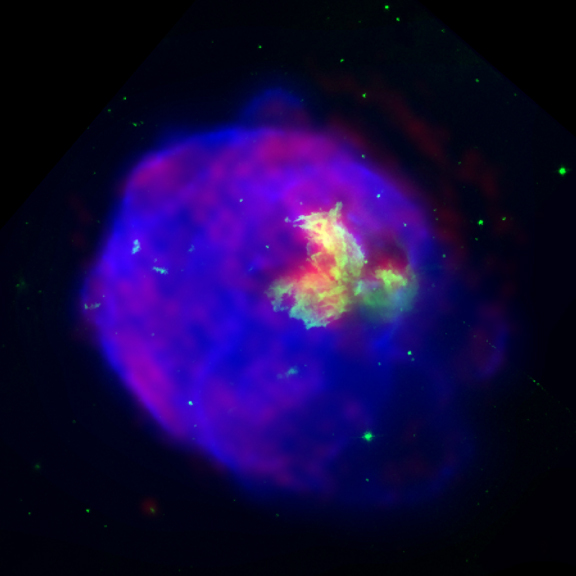 Chandra has imaged the glowing shell created by the destruction of a massive star. X-rays from Chandra (blue), combined with optical (green) and radio (red) data, reveal new details in the supernova remnant known as N63A, located in the nearby galaxy of the Large Magellanic Cloud. The X-ray glow is from material heated to about ten million degrees Celsius by a shock wave generated by the supernova explosion. The age of the remnant is estimated to be in the range of 2,000 to 5,000 years. Optical and radio light are brightest in the central region of the remnant, which appears as a triangular-shaped "hole" in the X-ray image. The hole is produced by absorption of X-rays in a dense cloud of cooler gas and dust on the side of the remnant nearest the Earth. A comparison of the X-ray image with the radio and optical images suggests that the shock wave is engulfing this massive cloud, so we see only the edge nearest the Earth. Collisions such as this are thought to trigger the formation of new generations of stars. The fluffy crescent-shaped X-ray features that appear around the edge of the remnant are thought to be fragments of high-speed matter shot out from the star when it exploded, like shrapnel from a bomb. In the only other supernova remnant (the Vela supernova remnant) where such features have been observed, the crescent shapes are clearly produced by ejecta fragments. An alternative explanation is that they were produced when the shock wave swept over less-massive clouds located several light years away from the site of the explosion. Credit X-ray: NASA/CXC/Rutgers/J.Warren et al. ; Optical: NASA/STScI/U. Ill/Y.Chu; Radio: ATCA/U. Ill/J.Dickel et al. Scale Left panel is 112 arcsec across. Coordinates (J2000) RA 05h 35m 44.10s | Dec -66° 02’ 14.00"
References J. Warren et al. 2003, Astrophysical Journal, 583, 260 "Revealing New Physical Structures in SNR N63A"